Tony Cefalu was recently named SVP of Hose & Rubber, Shops and Service Centers for Birmingham, Ala.-based Motion Industries. In this new position, Cefalu will continue to lead Motion’s efforts for hose, rubber, and gaskets, and now has the added responsibility for Shops and Service Centers—including Automation, Fluid Power, Pumps and Repair. We spoke with Cefalu about where he sees the hose business moving and how Motion fits in. Q: Give us a short rundown of Motion’s hose business. How much do hydraulic and/or pneumatic hose comprise of Motion’s overall hose business? A: The split is pretty even between Hydraulics and Industrial Hose and Accessories. If you further break down the hydraulic portion its about 50/50 MRO to OEM. We have shops that are highly automated and can and do produce thousands of assemblies daily in a variety of constructions, types and sizes. Q: Do you see the development of more predictive hose for diagnostics/maintenance in the future? Are your customers asking for this type of technology? A: Our customers are asking for more diagnostics certainly. It’s a complicated issue in that the end user has to be willing to do the maintenance required, which most times is inconvenient but necessary. We have customers that are 100% committed and some not so much. We also do a lot of survey and testing, both on site and at our shops for customers to maximize the service life of the hoses we provide. Q: How important is on-site hose service and repair to your business? A: More important each year. As mentioned earlier, we do both on-site and in-house repairs. On-site capabilities are expanding at Motion Industries with mobile equipment assets in the field. We are asked to do more everyday, it seems, and we are happy to accommodate. 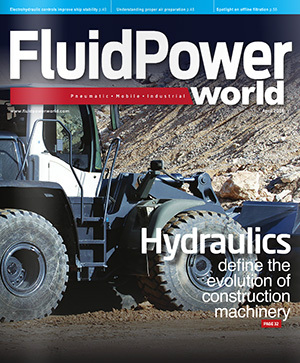 Q: Are there any roadblocks to hydraulic hose growth in the future? What industries do you see the biggest opportunities in? A: I don’t see any particular roadblocks. It’s a global economy, of course, and the exchange rate sometimes works in our favor—today it does not. So we deal with the import product challenge daily. But, we sell proven products that perform safely, to specification, and at a competitive price so we feel good about where we fit in the supply chain. We like the mobile hydraulic business, but frankly, we service our branches so we have to be prepared to sell a few metal hose assemblies or 5000 hydraulic assemblies. It’s never dull. Q: What else do our readers need to know about Motion’s hose business or future plans? A: We like the hose business and continue to invest in people, machinery and locations. We recently purchased Moss Rubber—with two locations in Northern California—and are looking for other opportunities to expand through acquisition. We have an aggressive plan going forward that has total support from the top down. It’s an important product group for Motion Industries and will remain so.